The BBC has dismissed complaints that Newsnight altered a photo of Jeremy Corbyn to make him look more Russian. 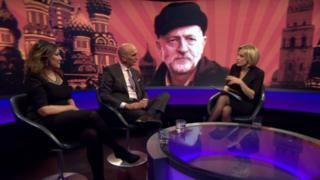 Thursday's show used a graphic of the Labour leader next to images of Moscow as the backdrop to an item about his response to the Salisbury poisoning. Critics said his hat was digitally altered and it was all designed to make him look like a "Soviet stooge". But Mr Corbyn's attire was "not in any way altered or 'Photoshopped' to appear 'more Russian'", the BBC said. In response to complaints, a statement from the corporation said the BBC Two news programme had "a long-running tradition of arresting graphics", which were "applied to all types of stories". The backdrop showing Moscow's Red Square had previously been used in a similar mock-up showing Defence Secretary Gavin Williamson, it said. It added: "Mr Corbyn has been photographed wearing this particular hat and coat many times, and they were not in any way altered or 'Photoshopped' to appear 'more Russian'." On Friday, left-wing columnist Owen Jones appeared on the programme and told presenter Evan Davis: "The media framing has been a disgrace and I have to say that includes your own programme. "Yesterday the background of your programme you had Jeremy Corbyn dressed up against the Kremlin skyline, dressed up as a Soviet stooge. You even Photoshopped his hat to look more Russian. "People should complain to the BBC about that kind of thing." Newsnight's acting editor Jess Brammar defended the show on Saturday on Twitter. "By all means criticise Newsnight," she wrote. "That's healthy, and we will always welcome people like @OwenJones84 coming on the show to criticise us from our own studio. "But no one Photoshopped a hat." The BBC has not revealed how many complaints were made.